5th Lancers. Scarlet leather pouch with silver flap ornamented with the Royal Cypher and Crown in gilt or gilding metal. The pouch belt was gold lace herringbone pattern with a central stripe of scarlet silk with scarlet Morocco leather lining. The silver breast plate, chains & pickers, buckle, tip and slide were of standard design. 9th Lancers. This regiment had a pouch that was unique within the regular cavalry. The pouch was scarlet leather with gilt flap heavily ornamented around the edges. On the flap was the cypher of Queen Adelaide reversed and intertwined in gilt. The pouch belt was of regimental gold lace with scarlet Morocco leather lining and no central stripe. The ornaments were also of gilt with the chain plate being a Garter Star. 12th Lancers. Scarlet leather pouch with silver flap ornamented with the Royal Cypher and Crown in gilt or gilding metal. The pouch belt was gold lace herringbone pattern with a central stripe of scarlet silk with scarlet Morocco leather lining. Instead of the usual breast plate, the regiment used a silver Garter Star while the chains, pickers, buckle, tip and slide were of standard design. 16th Lancers. The same as for the 5th regiment with blue stripe in the shoulder belt lace on a blue Morocco leather lining. 17th Lancers. The pouch was the same as the 5th, 12th and 16th regiments except it was of blue leather. The shoulder belt was of regimental pattern lace with white silk stripe in the centre and a white Morocco leather lining. 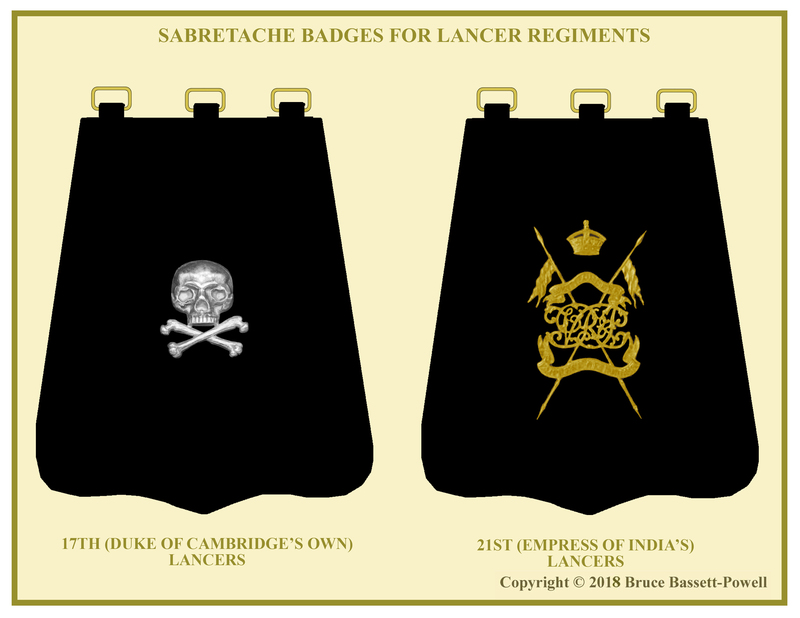 21st Lancers. The pouch was of black leather with silver flap. In the centre was the Imperial cypher in gilt metal. 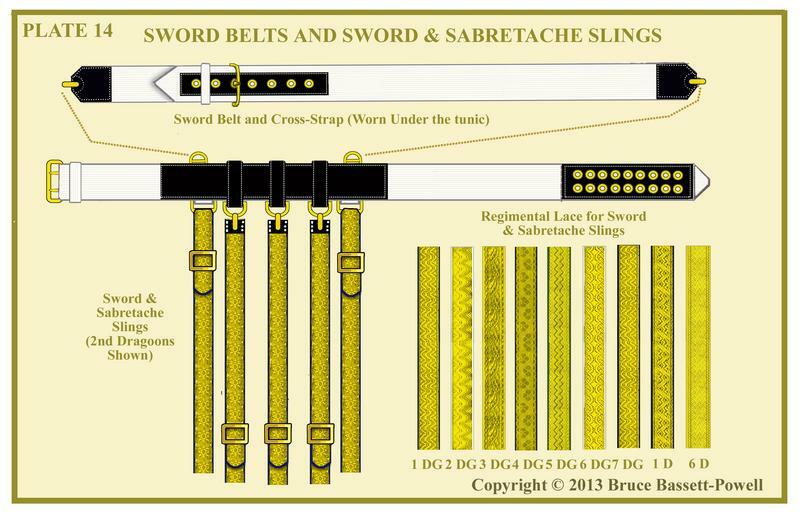 The shoulder belt was the same as that used when they were hussars being gold lace herringbone pattern with silk French grey stripe and leather lining. 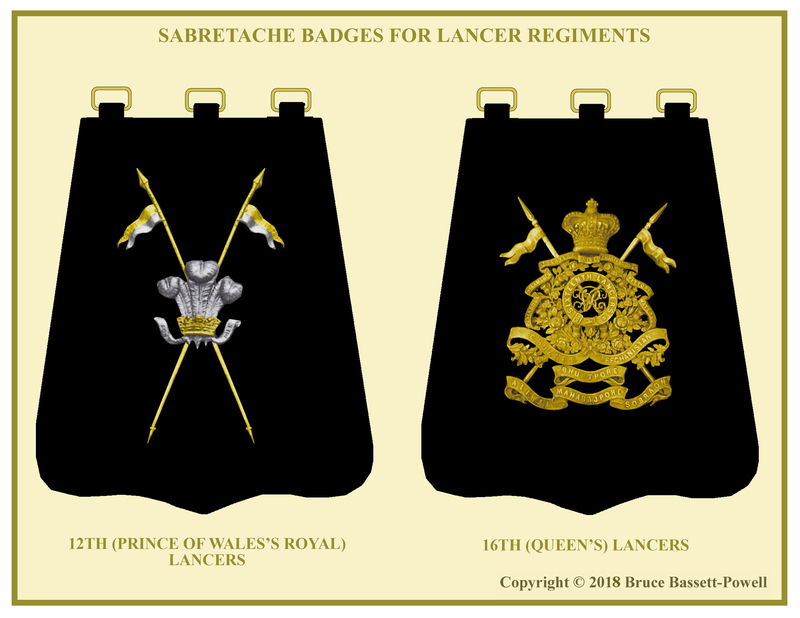 Until the middle of the 19th century, the Lancer regiments’ officers carried sabretaches with cloth faces with gold and silver embroidered devices. By the time of the Crimean War they were using black leather undress sabretaches, often with a metal device on the face. 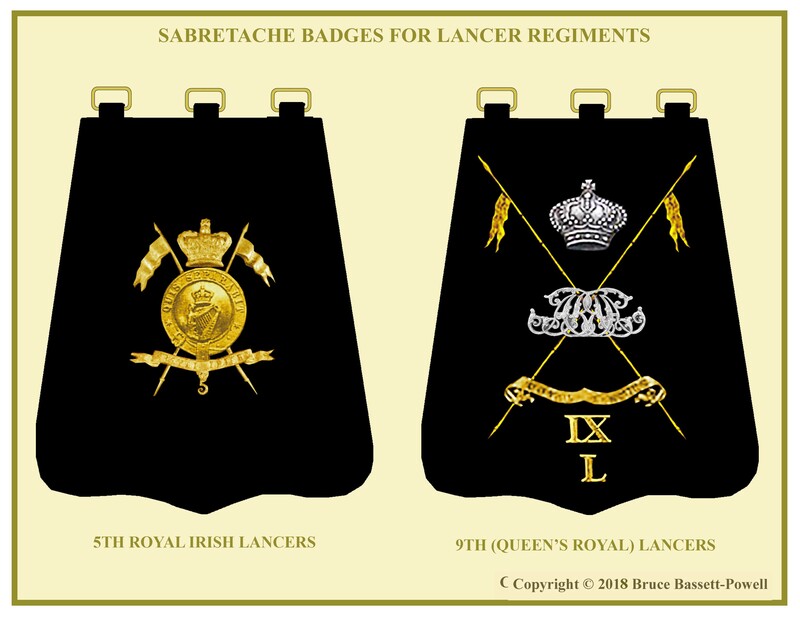 The Dress regulations that ensued simply describe the sabretache for Lancers as black leather with regimental device on the flap. The devices used from 1881 (in most cases different from those of the Crimean period), remained the same until sabretaches were abolished. 5th Lancers. In gilt, a garter over crossed lances. 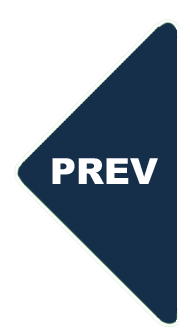 On the garter, the motto “QUIS SEPARABIT”. Within the Garter the Irish Harp on a raised gilt background. Below the garter a scroll with the words “ROYAL IRISH”. Below the scroll the number “5”. 9th Lancers. On crossed gilt lances the Cypher of Queen Adelaide doubled and intertwined in silver. Above the cypher a silver Guelphic crown. Below the cypher across the lance shafts, a gilt scroll inscribed “ROYAL LANCERS”. 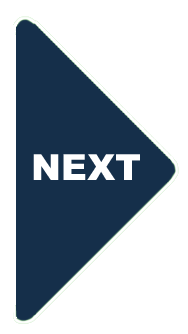 Below the scroll “IX” above the letter “L”. 12th Lancers. Crossed Lances in gilt, the lower half of the pennants in silver. In the centre, the Prince of Wales’s Feathers in silver with the coronet in gilt. 16th Lancers. 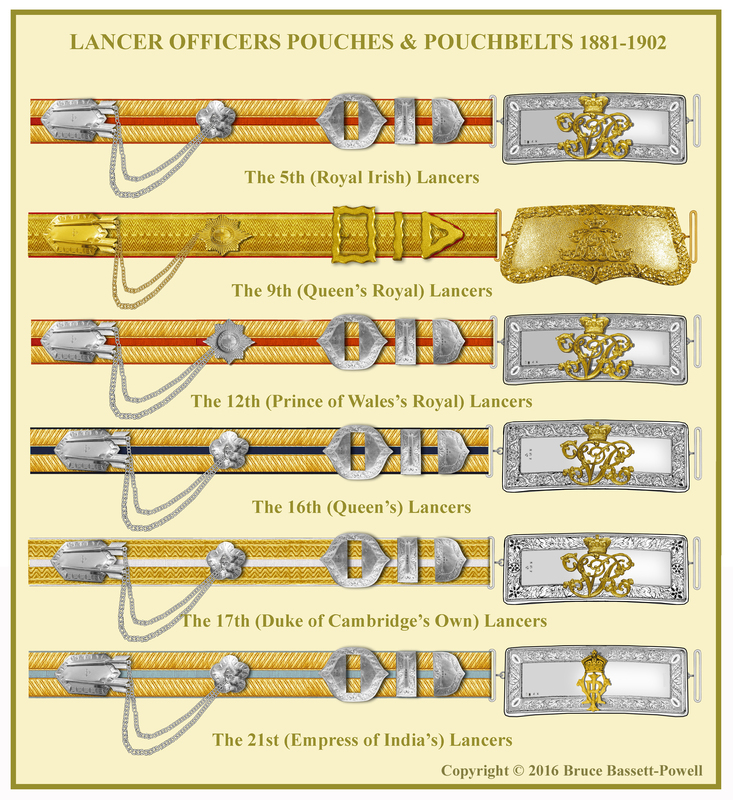 On crossed Lances a garter with crown above inscribed “SIXTEENTH LANCERS”. Within the garter the Royal Cypher. Around the garter a Union wreath with scrolls bearing the regiment’s battle honours. Below the wreath additional scrolls with battle honours. The whole in gilt metal. The 21st Lancers. On crossed lances the Royal Cypher doubled and intertwined. On a scroll above “XXI * LANCERS”. On a scroll below, “EMPRESS OF INDIA’S”. Above all, the Imperial Crown. 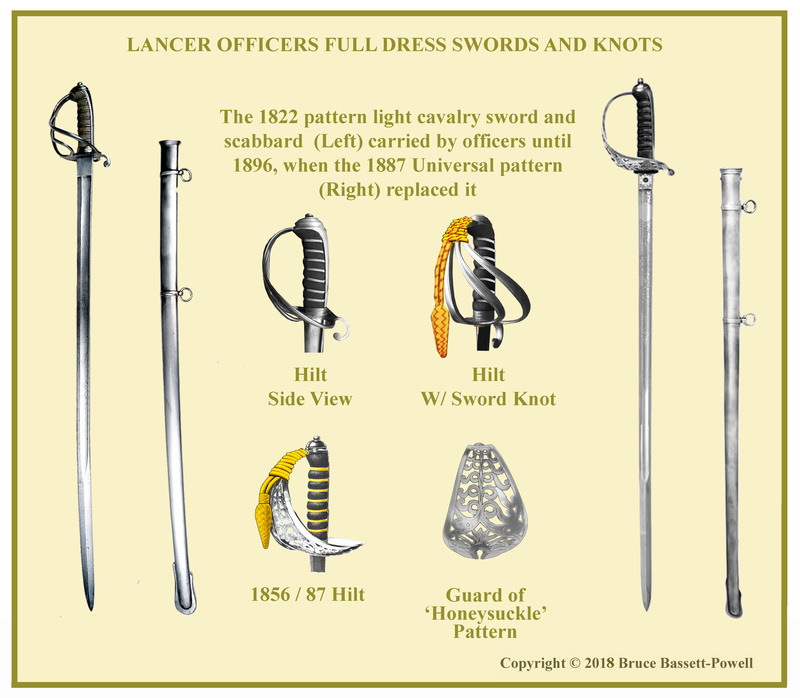 Lancers like other light cavalry had carried the 1822 pattern sword with three bar hilt for 60 years and although the chances of using it had receded by the mid-nineties, it was still carried for full dress and undress occasions. 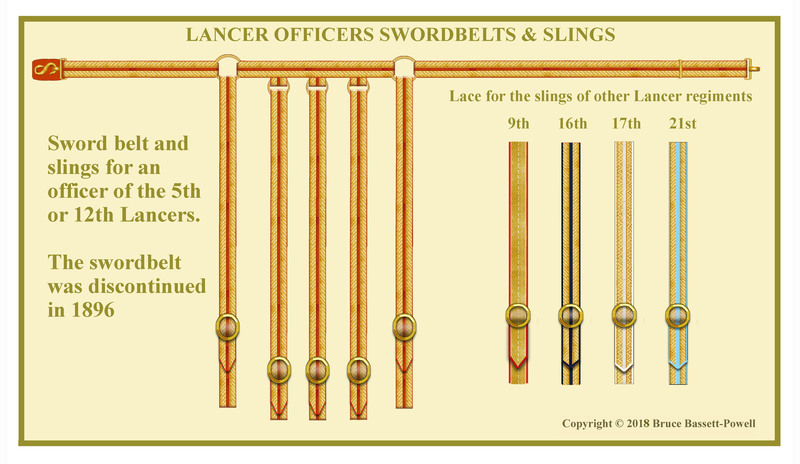 In 1896, officers were ordered to wear the 1856 pattern sword (modified in 1887). The sword knot was the gold and crimson type with acorn. The knot of the 9th was plain gold.